Coming into environmental consciousness is an ongoing process that looks different for everyone who cares to experience it. 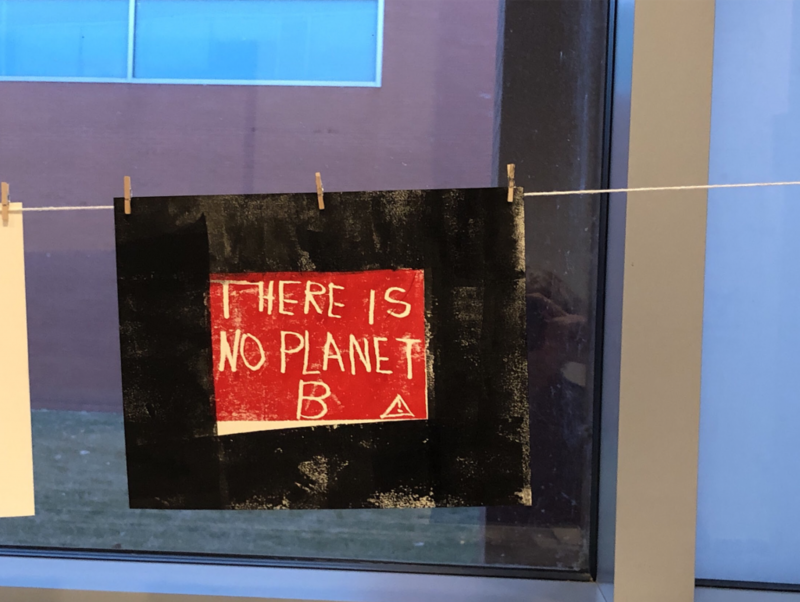 For local artist and Greencastle resident of 52 years Martha Opdahl, this process was inspired by the protests of her youth at the University of Wisconsin, the apathy of her peers and the alarming nature of modern climatology. It wasn’t until Opdahl had kids that she began to pursue art, eventually earning her Master of Fine Arts. Following this, Opdahl worked as DePauw’s gallery director and university curator. When Opdahl retired, however, the nature of her work took a turn for the environmental. This winter, Opdahl used one of Greencastle’s most abundant seasonal resources for the first of her push-back projects: snow. Opdahl describes each of her projects as spontaneous and locally inspired, so when she awoke one morning this January to a sheet of snow covering the town, she took to it with her trusty wooden spoon. In parking lots, yards, on sidewalks and street corners, she simply left the phrase, “there is no planet b.” She felt the medium was perfect, as it left a clear message with ultimately no trace to complicate her use of public property. Snow was the medium for her second installation as well. She rolled a sizeable snowball, littered with leaves, acorns, and grass, onto the corner of her yard alongside a sign which detailed the plant life stuck inside. She compared the pile to a miniature glacier, holding the fossilized remains of her maple and sycamore trees. Her goal was to have passersby see the snowball and recognize the local element of climate change and her fear that the lives of these trees will be cut short as a result. Though Opdahl sees these projects as successful, she has run into trouble in attempting to display her work around Greencastle. City officials have advised that she only put her installations on private property. 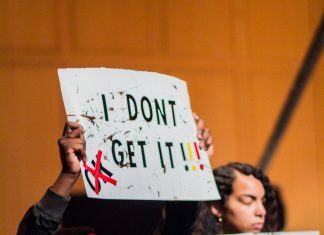 In response, she has spoken with Vice President for Academic Affairs Anne Harris and Center of Sustainability Director Malorie Imhoff in the hopes of using DePauw’s campus as a platform for activism. Though Opdahl hopes she can help bring this awareness through art to campus soon, she advises students to contact DePauw’s administration and trustees directly about changes they wish to see. 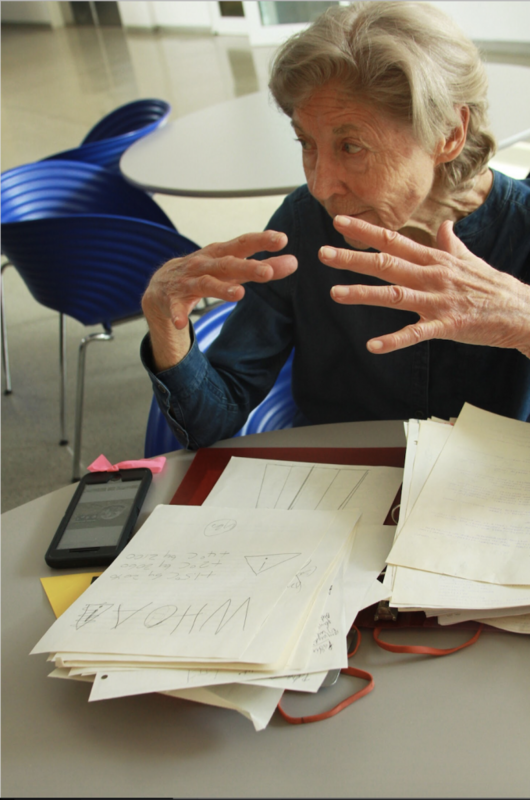 So if you see a small a yellow caution sign, Opdahl’s signature, on an environmental installation around campus or the greater Greencastle area, know that Martha Opdahl has been there and she’s here to stay.